“Nike+ involves the placement of a sensor underneath the foot bed of your Nike running shoe in order to collect data about where you’ve run, how long it took and where you can improve over time – since each individual run becomes part of a collective historical database. Even though Nike+ website already gives individual users a variety of features to make sense of their personal data, the collective analysis of this growing database is remarkably promising. 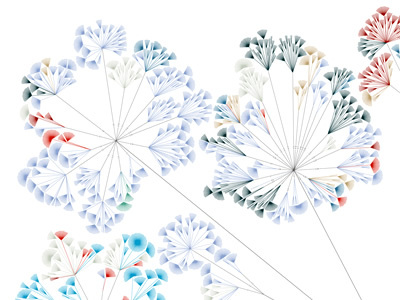 “Using the visualization tool Gephi, Elijah Meeks has produced a series of experiments depicting databases in diverse styles. The images show here are mapping the top contributors to the Catalogue of Life and their associated species, references and databases. “Writing Without Words, by Stephanie Posavec is a series of striking visualizations exploring the differences in writing style between authors of various modern classics. The images shown here are a visualization of Part One from the book On the Road by Jack Kerouac. 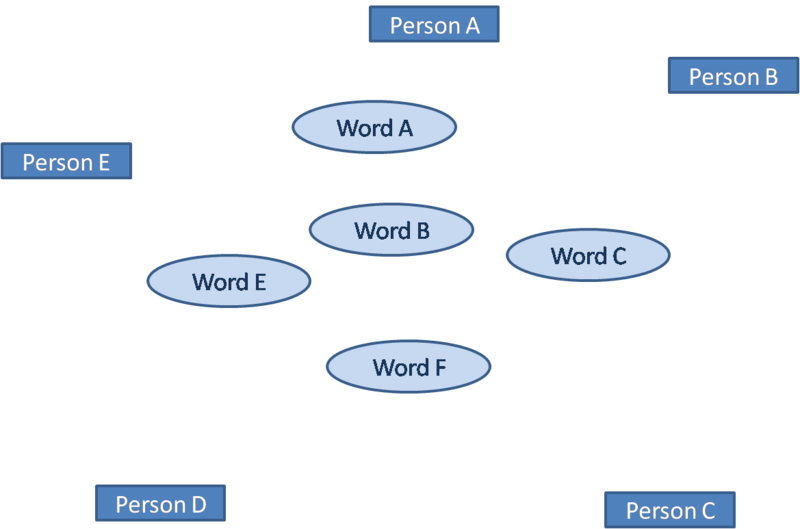 In this piece, entitled Literary Organism, each literary component was divided hierarchically into even smaller parts – Part, Chapters, Paragraphs, Sentences, and ultimately Words, the smallest branch in the diagram. Stephanie also created different colors to distinguish the eleven thematic categories she created for the entirety of On the Road. Some categories include: Social Events & Interaction, Travel, Work & Survival, and Character Sketches, among others. 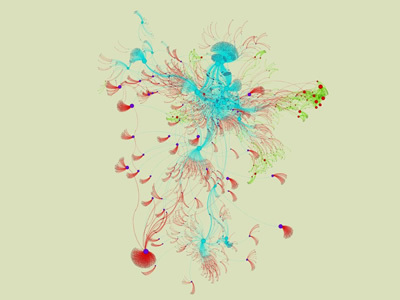 From tweet to action: Who moves social movements on twitter? 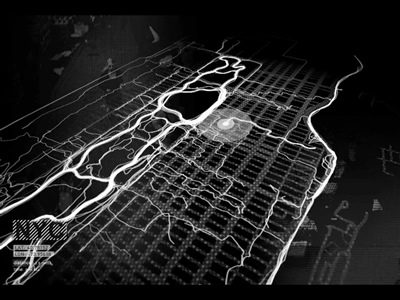 The fact that today’s social movements, from Occupy Wall Street to the Arab Spring, rely so heavily on twitter and similar communication tools, pose an amazing chance for researchers and other curious people who want to understand who moves these movements. 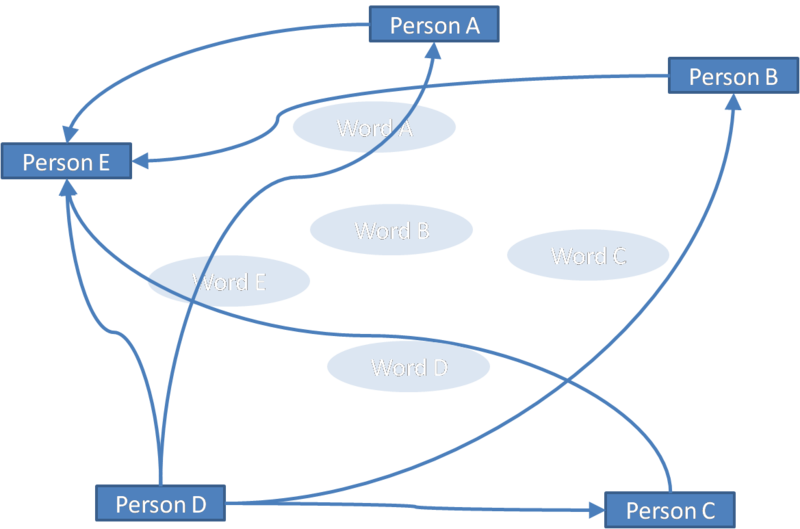 The other day I discussed with a friend what kind of networks you want to look at to better understand this and I’d propose three different kinds: People networks, semantic networks and two-mode people/semantic networks. People networks are the easy intuitive o nes: Who follows whom? Who re-tweets whom? Looking at this will help you understand who the leaders, boundary spanners, broad-casters are. Most likely, for an issue that manages the step from tweet to action successfully, you will look at a core-periphery structure, with a small inter-connected core (who might also communicate regularly outside of twitter) and a large periphery of followers, who are less inter-connected but look at the core for calls to action and thought leadership. Over time, different clusters might pop up as their own sub-cores or even take over from those initially starting the debate. 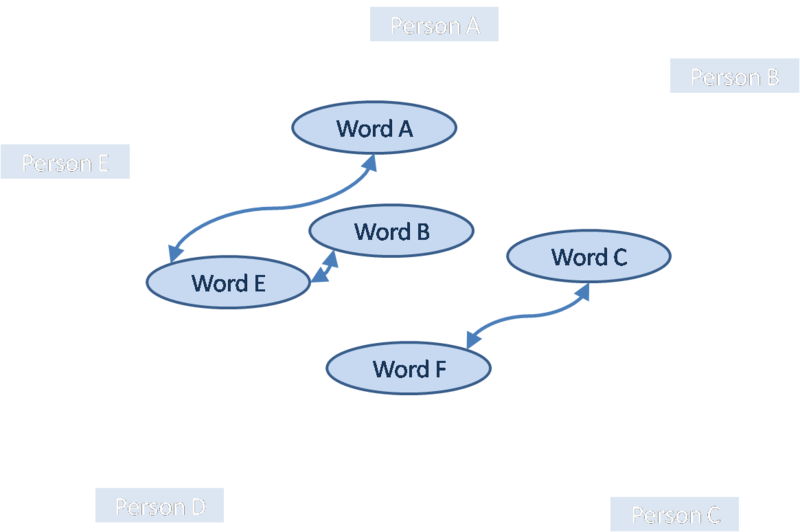 Semantic networks look at which words appear together in the same document (a document could be a single tweet, a string, all tweets from one person, whichever works). This can tell you something about the discourse around your issue: Is it just one large well connected issue or are there different schools of thought (more moderate and more radical for example or more philosophical versus more pragmatic and logistics oriented)? You might see that things evolve over time, for example it might be that the movement starts out united behind one cause (“Let’s overthrow the government!”) and after that is achieved, the debate disintegrates in many different camps (moderate and radical islamists, market oriented democrats, socialists etc.). And to really understand how this development of the debate and the connections between the tweeters hang together, you want to look at two-mode networks. But I have to warn you, they are the least intuitive. In a two mode-network you look at two different categories of things, for example people and words and how they connect to each other. So, there are no direct links within one category (no people-to-people links or word-to-word links). This picture shows you: Who uses which words? Who is connected by being part of the same discourse (even if they have no direct link to each other)? By looking at all three of these together, you can see who the leaders are, what their role (content) in the movement is and how that develops over time. And if you can compare either different incidents or different points in time, you will learn something about the network structures that are best suited to lead from tweet to action.